At Mizzou Ed, we value diversity, equity and inclusiveness — inside and outside the classroom. We are committed to preparing teachers, educators and other professionals who can embrace different perspectives and respect individual differences. We also strive to create an environment where all students, faculty and professional staff feel not only welcome — but also safe and valued. Established The Bridge, a conversation space for students, faculty and professional staff to develop and expand their cultural knowledge, awareness and competencies. Hired 87 new faculty since 2010, including 33 percent of tenure/tenure-track faculty from under-represented groups. Established a Diversity Committee in 2011 to provide leadership that fosters diversity and inclusion for all College of Education students, faculty and professional staff, which included the launch of the Commitment to Diversity Award in 2015. Established the Office of Recruitment and Retention in 2011 to increase the recruitment and retention of more students from diverse backgrounds. Created the Office of International and Intercultural Initiatives in 2012 to support new collegewide diversity-related initiatives and programs. Created the Office of Graduate Student Initiatives in 2012. Launched the Personal Transformational Pathways/Mizzou Ed Teach Abroad program in 2012 to provide Mizzou Ed students with international opportunities to learn about and participate in the educational systems of host countries while immersed in cultural settings that expand their understanding of local cultures. Created the Dorsey Leadership Academy in 2013 to provide leadership opportunities and other programming for future teachers from underrepresented groups or those who are the first in their families to earn a bachelors degree. Launched the National Alliance for Black School Educators in 2014, which received the Chancellor’s Excellence Award for Best New Organization. Launched the Mizzou Ed Weekenders program in 2014, a student-led partnership with diverse schools throughout the state of Missouri. Each experience combines the opportunity for participants to observe/assist with instruction in Mizzou Ed’s partner schools and serve the communities surrounding the school. Sponsored a weeklong trip to Detroit in 2015 in partnership with Mizzou Alternative Breaks, where students assisted a local elementary school and learned about social disparities that directly impact the education system. Created the Dialogues program in 2015 to facilitate gatherings where students can talk about issues pertinent to education, especially education issues related to underrepresented groups. 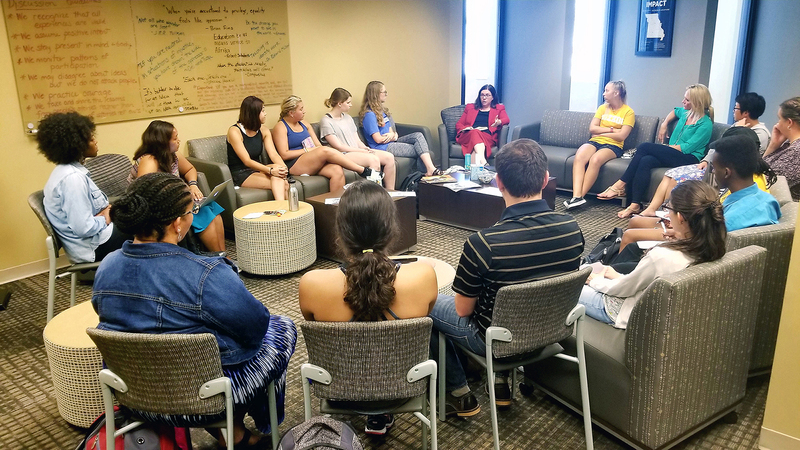 Some of the discussions are taking place in Spanish at the “Mizzou Ed Habla Espanol,” where native speakers and second-language speakers of Spanish have an opportunity to practice, maintain and enhance their language skills. Counseling psychology offers a minor and graduate certificate in multicultural psychology, supports the Coalition for Cultural Competency, offers a dual degree program with National Taiwan Normal University and Beijing Normal University, provides a clinical study abroad program, offers assistantships through the Women’s Center and International Center among other initiatives. Educational leadership and policy analysis is a leader in offering numerous diversity panels and discussions, especially in 2015 related to incidents in Ferguson, Missouri and Baltimore, Maryland; sponsors a summer workshop for students from Prince of Songkla Unversitiy in Thailand; and hosts an international diversity conference sponsored by Prince of Songkla University and Mizzou Ed, among other initiatives. The mission of the Diversity Committee is to provide leadership that will foster diversity and inclusion for all College of Education students, faculty and professional staff. The Diversity Committee will promote transformative experiences and curricula that increase cultural competence and facilitate positive environments. Membership: The voting members of the Diversity Committee will include a faculty member from each department, four professional staff, one member from outside the college, one representative from the Graduate Diversity Council and one representative from the Undergraduate Diversity Council. In addition, the associate dean for academic affairs will serve as an ex officio member of the committee. Student inclusion: The Diversity Committee will have corresponding Graduate and Undergraduate Diversity Councils made up of students from the college. Graduate and undergraduate students will apply to be members of these councils. The application process consists of a form including a personal statement, a resume and a list of faculty references. Officers: The committee will elect two members to serve as co-chairs. Minutes will be taken by a professional staff member from the associate dean’s office or by committee members in rotation. The committee may elect to operate as necessary to address each of the responsibilities in its charge. In addition, it may address any other charges related to diversity as assigned by action of the Mizzou Ed faculty or the Mizzou Ed Policy Committee.